Nettley, showing a little age. Lemon and orange rind, grassy, some wild sage-bush. Lemon-scented honey aromas blend with lime, passionfruit and guava, with a little green tea thrown in. The palate is developed, as expected by now, and shows lemon curd, gooseberry, green bean and roasted green capsicum. Nice weight, texture and acid. Following on from the outstanding 2009 vintage Savvy and maybe falling short of those heights, but still a good wine – although I would be drinking it soonish. A stylish feel, but probably lacks the oomph factor of the previous vintage. As chance would have it, I learned via Twitter that Gary Walsh (Winefront) was tackling the 2010 MCC Sauvignon Blanc on the same night and giving it big raps. I must have a crack at this wine. Stay tuned. Value: $18 – there's good value in the entire Mountain Range. 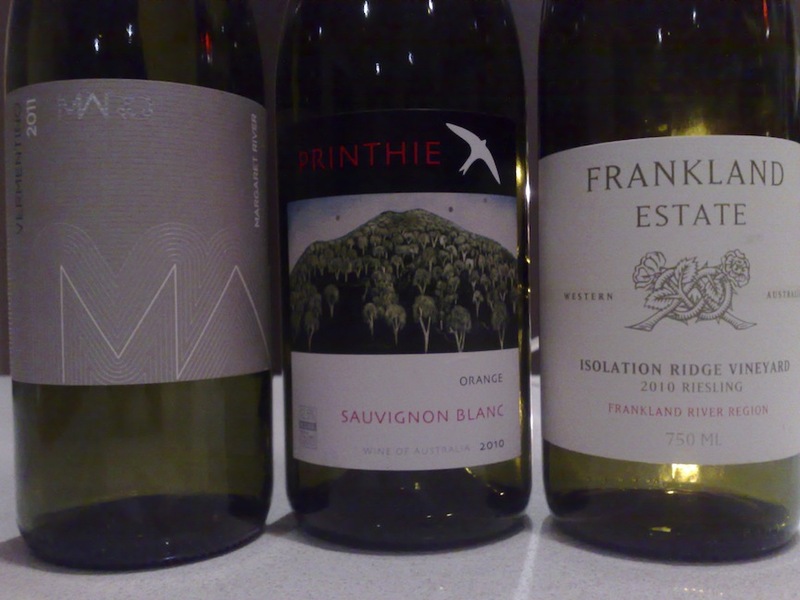 Producer: Printhie Wines – www.printhiewines.com.au - owned by the Swift family. Region: Orange, NSW - the NSW central tablelands east of Sydney - a region of high-ish elevation. Vintage: A difficult vintage with yields down across the board for many – although some excellent quality prevailed. Minerally, slatey, flinty... There I said it. Floral aromas with citrussy lime and pear – there’s more going on here than in the average riesling flavour spectrum. There’s freshness and zing, lifted flavours and aromas. Refreshing. There’s broad flavours in the citrus and tropical sphere, and some spice and fruit blossom, but there’s also drive and length and focus. And there’s more of that flinty goodness. I don’t care what Philip White says, if I want to call a wine minerally I damn well will, and you all know what I’m talking about. Pure and fresh. Naturally exciting. This is a very good, benchmark WA Riesling. I’ll have some more please. Value: At $32 it aint cheap, but this is the sort of wine you can pull out at a dinner party and impress the guests. A bit wanky, I know, but that’s wine for you sometimes. Producer: Frankland Estate – www.franklandestate.com.au – family-owned, established in 1988 by Barrie Smith and Judi Cullam. Region: Frankland River, West Australia. Adjacent to Great Southern in the cooler south of WA. Vintage: An ideal vintage for the Great Southern and Frankland River regions. Warm summer days and cool nights. Hard to make a bad wine from this year. All I can tell you about this new player in the Margaret River region is that it's the private label of Happs winemaker, Mark Warren, and a variety you don’t usually see around Margaret River. It’s light and slightly oily-textured – the flavours are in the spectrum I quite like: lime and pear, peach and apple blossom, grapefruity, floral and perfumed – neat, tidy, gently flavoursome in a restrained sort-of way. Maybe too gentle? It doesn’t have the grunt of other vermentinos I’ve seen, nor the viscosity, but it is freshly bottled so perhaps showing some shyness at the moment. Ne'erless, it's a delightful little romp in the fields, and a perfect pre-dinner drink over spring and summer. With food? You’d be mad not to pair it with seafood – sardines, of course! Producer: Marq Wines – www.marqwines.com.au – Happs winemaker Mark Warren's own label. Region: Margaret River, West Australia. Vintage: A cracker vintage in the west – perfectly warm temps during the day and cool nights – fruit was ripe with good acids. A winemakers delight. Do you know where if/where they are available for tasting Jesse?